Yes, the XUV300 is based on the SsangYong Tivoli. But, every single body panel on the small SUV is brand new. To make the XUV300 duck under the 4-metre mark, Mahindra has chopped nearly 200mm from the overall length of the Tivoli. This does make the rear-third of the car look a bit odd. 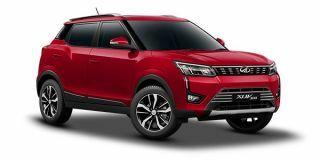 From the front, the rectangular headlamps, the chrome-studded grille and the daytime running lamps establish an instant connect with big brother XUV500. Features include projector headlamps, machine-finished 17-inch alloy wheels, a dual-tone colour scheme and LED brake lamps. For all the wow bits on the exterior, you do wish Mahindra had not copy-pasted the dashboard design of the SsangYong Tivoli. The plethora of buttons aren’t easy on the eye, and small bits like the orange backlight for the climate control and the tiny 3.5-inch MID take away from an otherwise plush cabin. In terms of features, the top-spec W8 (O) variant comes loaded to the gills with goodies such as a sunroof, dual-zone climate control, cruise control, configurable lighting for the instrument cluster, a tyre direction monitor and a 7-inch touchscreen infotainment system with Android Auto, Apple CarPlay and navigation. We do wish the cabin was a bit more spacious, and that the boot was slightly larger as well. As far as safety is concerned, Mahindra is offering dual airbags and ABS with EBD as standard across the range. The top-spec W8 (O) variant additionally gets side and curtain airbags, electronic stability control, traction control, and a tyre pressure monitoring system.